West End? Psh... it's all about Havana Central now. When I was in undergrad the West End was the go to bar for most of the frats and sororites on campus... which means I rarely set foot in there. I can see the appeal of shot girls and jello shots with whipped cream on top and slipping around in someone spilled something, but I'd rather do that in one of the bars down in the Village. A while back this place turned into a cuban restaurant called Havana Central. In its earliest incarnation I visited and was mighty underwhelmed. Now that I'm back in the neighb and always up for giving a place another chance I've changed my tune. This is a media noche. It's a cuban sandwich (ham, roast pork, pickle, mayo, mustard, infused with deliciousness) on a sweet roll instead of the standard bread! *Surprise cheese is cheese you don't know is going to be in your dish, but you're happy to find anyway. 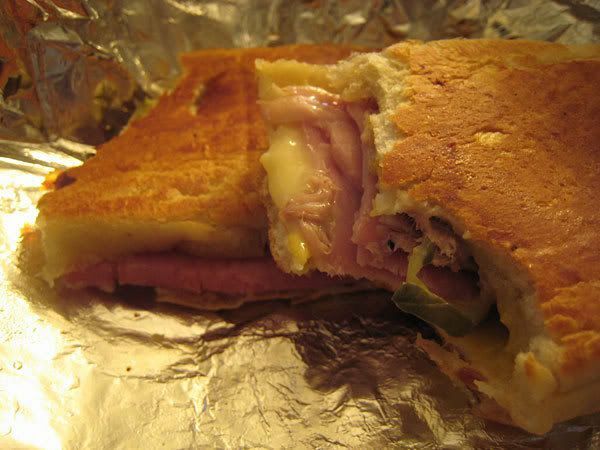 In "cuban sandwich", "food", "ham", "reviews"